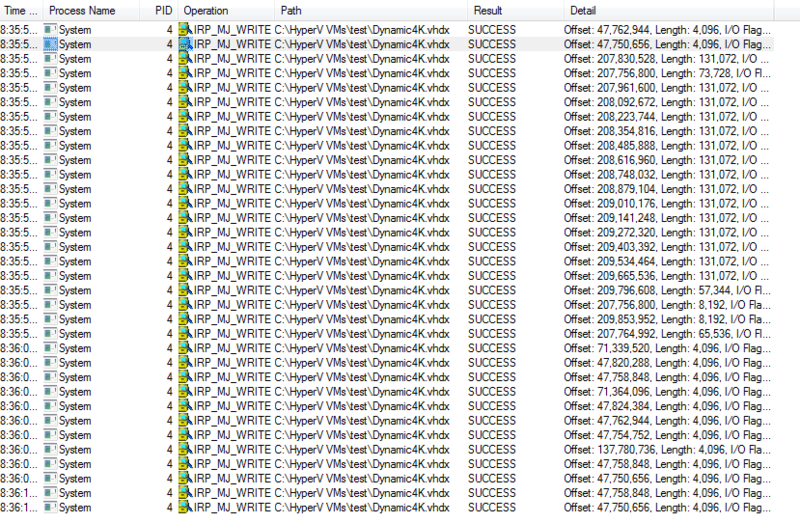 I have been testing the Windows 8 dedupe feature, especially so for large VHDX files. But the testing has revealed a major “wish”. Hopefully somebody from the right department at Microsoft reads this and at least puts it on a feature list for the future. Xcopy – (and yes – xcopy /J –see my previous blog “Tips for copying VHD and VHDX files”) the VM1.vhdx file to say VM2.vhdx. That’s 40 GB of reads and 40 GB of writes. Repeat the xcopy to a different destination file – Xcopy /J VM1.vhdx to VM3.vhdx and that’s 40 GB more reads and 40GB more writes. Now let the system idle, make sure it does not hibernate, wait for dedupe to read all 3 VHDX files ( 3 X 40 GB worth of reads, etc) and dedupe the files. Run a PS script that creates an instantly deduped second copy of this VHDX file – with all the associated dedupe metadata. So now I have 2 VHDX files that are identical and have been deduped. The PS script would have to invoke some custom dedupe code Microsoft could ship. Create a new file entry for say VM2.vhdx and create the dedupe metadata for VM1.vhdx and VM2.vhdx. This would save 100s of GBs of reads and writes, and administrator time, increasing productivity. Whether you call this instant dedupe or not is up to you. In the interest of keeping the focus on the instant dedupe scenario, I have deliberately avoided the details of requiring Sysprep’ed installations. But the audience I am targeting with this blog will certainly understand the nuances of requiring Sysprep. If you are a Microsoft MVP reading this blog, and you agree, please comment on the blog, and email your MVP lead asking for this feature.